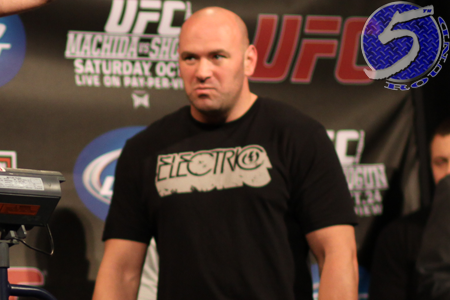 UFC president Dana White (Pictured) was as giddy as a schoolgirl during Thursday’s UFC 149 pre-fight press conference. White was so pumped for Saturday’s fights that he promised to reveal his top secret plans for the middleweight division during tonight’s post-fight presser. Unfortunately for fans anxious to see what the new 185-pound pecking order looked like, or who might get next dibs at Anderson Silva’s crown, sorry. White was far too irritated from the lack of sizzle UFC 149’s featured fights provided (outside of the show’s featured attraction between Urijah Faber and Renan Barao). Clearly, Hector Lombard’s disappointing big league debut played a significant role in ruining White’s plans. Despite entering the Octagon as a whopping 4-to-1 odds-on favorite, the former Bellator middleweight champ dropped a split decision loss to Tim Boetsch in a lackluster performance. Even though his defeat was controversial, Lombard’s showing was still far from impressive. However, Boetsch believes he broke his right foot at some point during the 2ndRound. So he might be sidelined for several weeks.